Do you like to dig in the dirt? Find things that are lost? Put pieces together? Figure out stories from clues? Learn about the past? These are all things archeologists do—maybe you're one, too! Archeology is tons of dirt-digging, story-telling, mystery-solving fun. 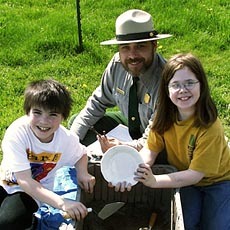 Like you, many archeologists caught the archeology bug as kids. Get started by looking through our site. An adult can help you to find a site or a museum to visit. Dig in! Archeologists want to know how people used these artifacts and why. Archeologists are anthropologists, meaning they study people, but they are not geologists (who study rocks and minerals) or paleontologists (who study very ancient reptiles). Archeologists look at old things and sites to investigate how people lived in the past. Archeologists are a hardy bunch. They dig everywhere, including in old garbage piles and toilets. They seem to know something about everything people in the past did: how they made tools, why they moved around, and what kinds of foods they ate. Be part of a field crew. 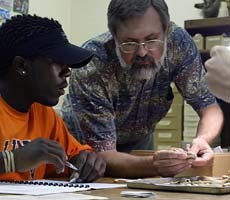 Join a field school, where many archeologists learn to excavate, or volunteer. A field crew is the team of people who excavate sites. Many archeologists on field crews have lots of experience and excavate as their job. They might have a graduate or doctoral degree in archeology. Many archeology projects have field crews who are new to archeology, like students and volunteers, who want field experience. Keep clicking on the list to the right to find out who makes up the field crew team. Learn about working with artifacts from a collections specialist. 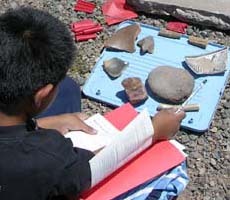 Also called curators and archeological technicians, collections specialists take care of excavation records and artifacts. Collections specialists work everywhere archeological collections go, including museums, historical societies, colleges and universities, and parks. They help to preserve archeological materials and work with researchers and the public. 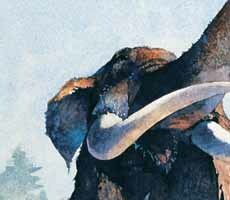 Study of the remains of ice age mammals shows how ancient people hunted and ate. 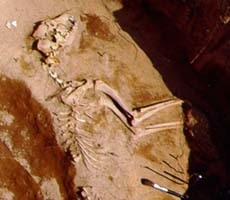 Zooarcheologists investigate what animals people raised as work animals and pets, like this dog. Zooarcheologists study animal remains, or fauna, from archeological sites. Their work shows what people ate, the animals they hunted and raised, and about their health. 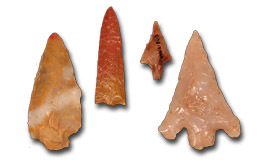 Bone up on zooarcheology by visiting the Aucilla River Prehistory Project in Florida. Meet a faunal expert who works with animal and shellfish remains from the Lott House in New York. Underwater archeologists plot shipwreck artifacts and other submerged resources. Many WWII-era experimental weapons, like this underwater fighter plane, never quite panned out (just kidding). A little water won't stop archeologists! 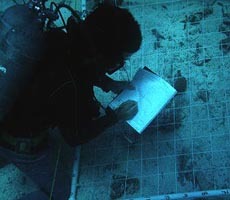 Underwater archeologists use similar methods as landlubbing archeologists. 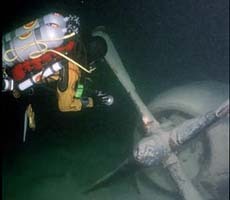 They excavate everything from rock shelters to abandoned ships to airplanes. Their work tells us about seafaring life and culture, such as war or the cargo carried for trade on shipwrecks. Submerge yourself in Down Like Lead: 400 Years of Shipwrecks. Find out about NPS underwater sites at the NPS Submerged Resources Center. 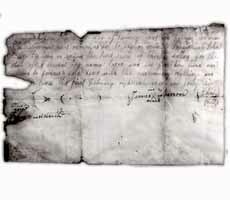 Family documents show that James Robinson bought some of his children out of slavery. 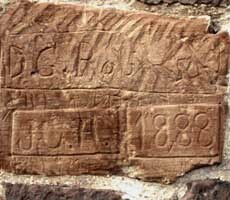 Robinson couldn't free all his children, but they found a way home and carved their names in this fireplace brick. If you like to read family records, diaries, letters and maps, historical archeology might be for you. Historical archeologists compare documentary sources with what they find at sites. 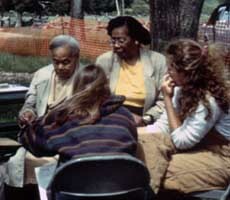 Sometimes they find the actual events or artifacts described in the texts hidden in the ground. Read into it at The Robinson House at Manassas National Battlefield in Virginia. Environmental archeologists think ancient desert people people ate differently as the landscape dried out and large animals left. Coso's people drew hundreds of bighorn sheep, but environmental archeologists think they were rare and find very few bones at village sites. 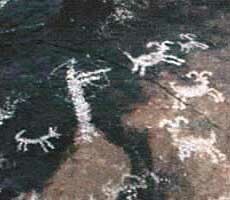 Environmental archeologists look for answers about the relationships between the Earth and people. 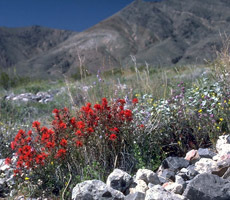 They look for ecofacts—natural remains—such as those of wild and domesticated plants and animals found in the archeological record. Branch out to the Florida Museum of Natural History to see their projects. 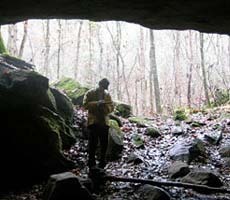 Geoarcheologists study how people used caves for shelter and storage. Geoarcheologists look at the changing relationships between people and rocky places over thousands of years. Geoarcheologists tell us about what earlier landforms were like and how people may have used them. Put on your x-ray goggles to learn about geophysical archeology at the Garden Coulee site on the grounds of Fort Union Trading Post National Historic Site. Oral historians talk with the Robinsons to learn how their great-grandfather lived and what his farm was like. Archeologists talk with people to learn about what they remember about growing up in a place, how they lived and worked, and how they used the objects archeologists dig up.